The Sturmey Archer S2C is a hub full of golden promise within its very specialised niche – without any cables at all, you get a low/high gear and a brake, with good efficiency and reasonable weight. If it wasn’t sold off the shelf with a serious mechanical fault requiring the end-user to rebuild it with a new part shipped out by Sturmey Archer (yes really), and didn’t fatally explode after a few hundred miles, it would indeed be great – but more on that later. Update: my hub exploded, locking up in the frame while I was riding. Scroll to the bottom for conclusions. Unlike with a 5+ speed, with the Sturmey Archer S2C you need to think in terms of building a ‘sensible singlespeed’ rather than a hub geared alternative to a derailleur bike. It flips between 1x and 1.4x (say, 50″ and 70″, or 60″ and 84″). Previously I had a fixed-wheel running about 65″, so in other words, it’s geared to ride quite a lot faster (and climb a lot better) than my old fixed, but the range is miles off what you’d get even with a single ring and 11-32 (which could do 30-106″). Compared with other hub gears I’ve used (the Sturmey Archer 5 and 8 speeds and the Alfine 8), the S2C is extremely efficient. 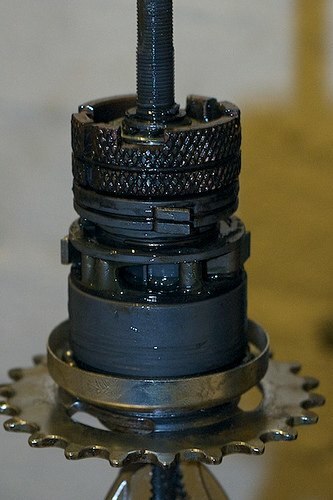 The low gear is direct (the sprocket is locked to the hub shell, effectively the same as a track hub), while the high gear goes through a single ‘step-up’ planetary assembly. I can’t identify any friction in high gear; that doesn’t mean it isn’t there (in fact I’m certain that obsessives could measure it without particularly high-tech lab equipment)… just that I can’t distinguish it riding through the real world. With the coaster providing invisible braking, the Sturmey Archer S2C does build up into a very clean rear end – it needs a reaction arm secured somewhere to the frame, but I was pleased to discover that the slot disc mount on my Pompetamix is perfect for a clean attachment as you can see in the image above. Very stealthy! The only other way to get something like this is to ride fixed with your back brake removed. The brake is smooth and strong and easily modulated, although it’s worth noting that you can ‘bite’ extremely hard if you put the pedals back hard. I almost came a cropper when I absent-mindedly tried to rotate the pedals backwards to 3 and 9 o’ clock while standing up to jump over a kerb. The bike suddenly and dramatically slowed down under me as I came out of the saddle, I slowed down and mis-timed my kerb lift… but luckily the sensible tyres came through for me! Unlike most hub gears, which either come in ‘normal’ (~132.5mm) or at least normal and track widths, the Sturmey Archer S2C is only available in the eyewateringly-small 116mm OLN. The axle is not long enough to space it out for even a 130mm aluminium frame, sorry. If you have a steel frame however, which can basically just be bent (cold set) as you please, it is possible just to fit the S2C by springing in the stays (indeed my 135mm Pompetamix has not been cold set, I just stuck the S2C in there and did it up, and it’s not exploded so far). Placing the locknuts inside the dropouts adds another few mm on each side to ease the situation. Caveat experimentor! The above is a stock 135mm-spaced Pompetamix rear end on a stock S2C axle. The plate to the right is the hitch for my awesome Carry Freedom Y-Frame trailer. The bearings on the Sturmey Archer S2C are not only unsealed, but practically begging to be contaminated. There’s not even any kind of contact seal at all – the balls are basically peeping out of the side of the hub shell and are lightly covered by a metal ring, which I’m sure doesn’t keep out rain of any strength. You can see these in the photo above (the non-anodised light sections to the outside of the hub flanges). I’m prepared to give it the benefit of the doubt for now – and it can be easily maintained in truth – but it’s a far cry from the S5C, which I ran for a whole winter with nary a whiff of trouble. 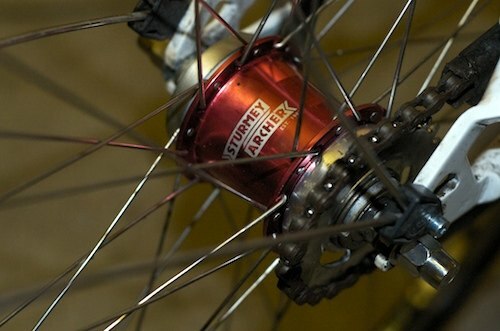 The original wheel I assembled for my utility bike was a Sturmey Archer S5C – a five speed hub with coaster brake. How that went wrong is a story for another day, but I ended up buying an S2C in my quest for robust simplicity. 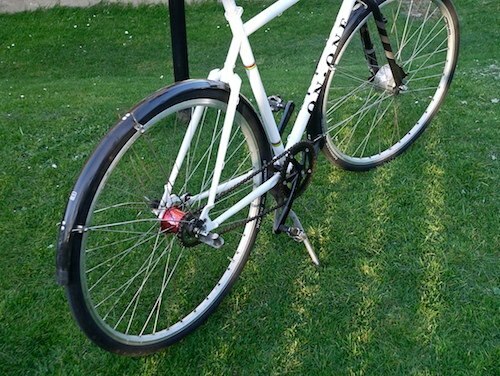 However – no sooner had I assembled the wheel than I realised it was unrideable in the the lower gear (direct drive) – even going downhill without pressure on the pedals, the slightest rotation of the cranks caused horrendous crunching and pinging. Another failed hub! To cut a long story short, I chased this back to Sturmey Archer – who essentially admitted that the S2C was produced with a piece missing – but never mind, I could have the piece mailed out and fit it myself in the mysterious guts of the device! As the hub is relatively cheap and simple, and I’m not afraid to break things, I decided to go for it and managed to effect the repair myself – disassembling the hub completely, breaking apart the drivetrain pieces and fitting a thick flanged spacer to support the suspect part. Here you can see the hub inner. From top to bottom: the brake shoes, the direct-drive ratchet pawls, the planetary with high gear pawls (these change in and out to toggle the selected gear ratio). It was amazingly messy and to make a successful job of it you will need C-clip pliers and cone spanners of the correct (nonstandard) sizes to tighten everything up. You’re trying to get the piece in between the two subsections that have pawls on the picture above… the long-term implications for the life of the hub have yet to be seen, naturally, and who knows whether anyone will warranty it now I’ve had to perform a triple heart bypass! A short time after effecting the above ‘repair’ to the S2C, I was riding along on the flat sea front when the wheel suddenly locked within the frame. Luckily I was just pootling at 20mph or so and not out of the saddle, so I managed to control the skid. One of the pawls within the hub had cracked in half, found its way across to the brake (or possibly just jammed some other part of the shell) and bang! Needless to say, this killed the hub stone dead after just a few hundred miles. An extremely poor performance and as a result, I can’t honestly recommend the S2C hub at all. I’ve bought a SRAM Automatix – see my in-depth review of that instead! Hi , where did you find it for £55? Thanks, was thinking of getting one but am a bit concerned now. Thanks for the tip off! From a shop on eBay, sadly the prices all seem to be back up around the £70 mark now. Of course, I’ve had to spend £20 on cone wrenches (16 and 23mm by the way) so I’m not at all ahead of the game! No, I tried to email Sturmey Europe but got no response. In the end I just went back to the dealer I bought the hub from, and they were able to sort it out. Anyone selling these must be familiar with the problem by now I’d imagine! So how long has this hub been out ? Is this just teeting problems due to the customer being used as test monkey ? Or is this just a good name being traded into the grave ? 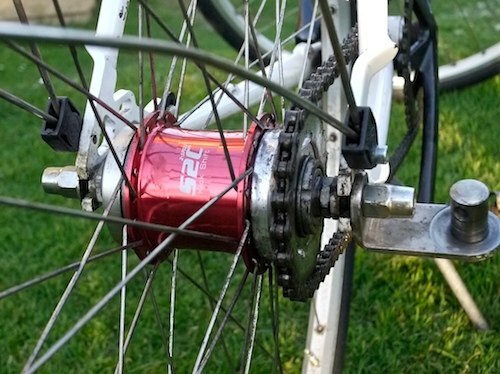 I bought one of these S2C hubs from a bikeshop here in Canada. It worked well for a short time, then started making loud banging/cracking noises, skipping in first gear, and suddenly freezing. I replaced it with a Velosteel hub, single-speed but much more solidly built, and smoother running. It is a modern-day version of the old Fichtel & Sachs Torpedo hub, and is made in the Czech Republic, not in a prison in China-where all the Sturmey Archer product is now made, not in Taiwan, as they would have you believe. 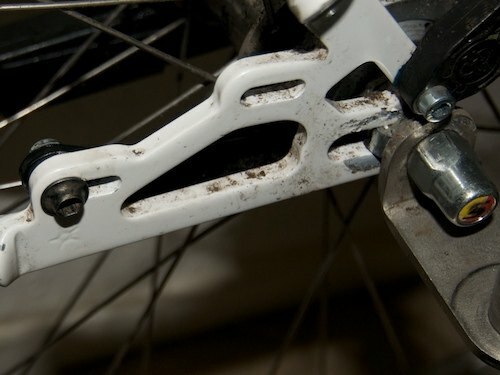 I had one of these hubs supplied on a new bike in July 2011. That one lasted about 500 miles before it gave up changing gear – not a terminal problem but still not good. I contacted Sturmey Archer in America and they were very helpful and got a new gear internal sent direct to me, having said that some of the early ones left the factory missing a part. I replaced the internals and then that hub failed again after about 500 miles with the same symptoms. I went back to the bike manufacturer who replaced the whole wheel. This time I got about 1,500 miles but this one failed catastrophically, as Dave’s did. I thought I would have one more go and bought a fourth hub from a trusted local shop but that one started to give up after about 1,000 miles so I gave up. I have since had a Shimano single speed and have just got a SRAM Automatix, which is brilliant so far. Such a shame the S2C didn’t work as I did prefer being in control of when the gear changes. I found your posts on the S2C and Automatix very helpful and very clear. I’ve been using one of these on a daily 2 mile commute for about 18 months. The extra gear is very helpful on the hills. The bike is Edwardian themed with a home made roller brake operating a centre pull Weinman brake at the front. No cables is essential for looks. My first hub ‘pulsed’ on braking, new internals were sent, no change, but the ‘pulsing’ went away after running in. Then a sharp cracking noise started happening in low gear, it went away and later the nub became hard to change into low gear. Pulled out internals, cleaned and re-greased the interior of hub, now changes gear great but the cracking noise in low gear is back…I really like the hub but fear a catastrophic failure will be soon. I’m tempted to strip it right down to check the gears has any one done a full strip?. I like the sound of the SRAM Automatix hub, how reliable has it been now? Following on from my previous post….the hub has now died. I was no longer able to engage 1st instead the pedals just spun. Could get 2nd though and the brake. When pushing the hub ceased until I kicked the pedals to release. I’m gonna take it bits when I get a chance. well i thought i was the only one ! the sturmy archer 2 speed hub is utterly useless,i bought a moulton belt drive and this hub gave up the ghost after two wet rides and less than two hundred miles,i’ve since replaced hub with s.a. 3 speed only hub that would fit that i could find, this hub 100% ok but now i’ve cables all over the bike where before there were none ah well.did some research sturmy discontinued the 2 speed hub way back after very short time due to unreliabilty problems! as said there are no seals anywhere,when i first complained to shop where i bought bike the mechanic said “have you been riding through puddles”!!! bloody hell i live in northumberland of course i ride through puddles,i then spoke to sturmy and was told by guy there “oh that bike i would’nt buy that until they sort that rear hub out”!!! great eh? near £1000 bike you can only ride very gently in the dry! I did take the hub apart, almost completely. The only fault I could find was a disparaged spring, which I sorted out with little trouble (a little bending and then relocating). I also completely re-lubed the hub with loads of grease and now its sweet as……. I missed this before I bought my Moulton TSR2, which was a shame. I’m on my third rear wheel now because the hub fails repeatedly. Wouldn’t touch it, or any Moulton built up with it. The first failed after 2 months over the winter, the second in the summer because “the coaster brake is only meant for light braking” according to the shop I bought it from. A real shame that a 50 quid hub means I’ll be trying to return a 1000 pound bike. Moulton don’t seem to care either. Luckily I’ve used my winter fixie rather than the TSR2 in the wet, so its held up ok. Thanks for the warning, I must get around to a strip & grease before it goes pear shape, Long term a SRAM automatix (with spring adjustment) sounds like the only answer. It’s crazy people can sell hubs without sealing in Europe, I had the exactly same trouble with an early Shimano Nexus 7. I got one free replacement, but gave up after the second. More people should make the effort with the Sale of Goods act, especially since it can be done online. How do you change gear with this hub? I’ve seen a video of someone with the non-coaster brake version and they seem to pedal backwards to toggle between the gears. 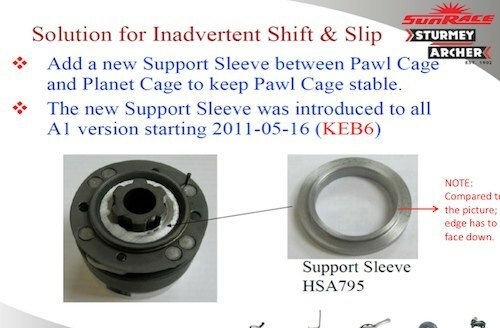 But if you pedal backwards to engage the brake, how do you change gear with this version of the hub? Hi, to change gear you do a small back flick (normally there is a small click from the hub), and this does toggle between the gears. To use the brake you back peddle more firmly. This does mean that using the back brake also means you change gear which can be a bit awkward at times. 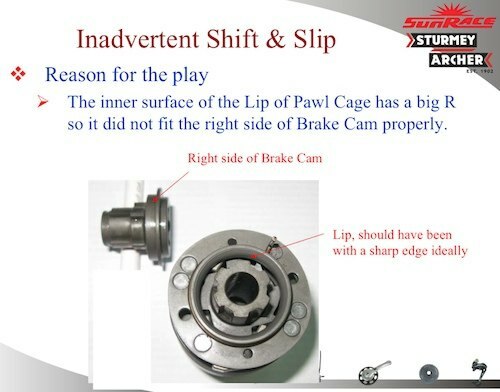 I got to the part where sturmey archers disclaimer alluded to a malfunction in the brake cam. I had no intention of using the cam operated brake. The hub was intended to go on a 120mm spaced screwed and glued Alan frame which wouldn’t hold up to the wear and tear of a brake lever attached to it’s chainstay. Has anyone used one of these hubs without the brake lever. I have a bike with a Sturmey Archer S2C that’s been temperamental ever since I got it – working for months on end, and then not wanting to shift and with bad brake performance. I’ve tried to have it fixed by other bike shops to no avail. Tonight, the breaks stopped working on a downhill slope and nearly caused a serious accident, so I need to have something done. I’m not sure if it’s missing the part you mention in the post – how do you figure that out? I tried mailing Sturmey Archer to get a replacement cassett, since I’ve heard about early manufacturing problems (This is a hub made in 2010); they asked about the serial number, which I haven’t been able to find. Oh, and since you’re in Edinburgh, are you aware of any mechanic you would trust with these kind of odd bike parts? Thankful for any tips! Gustaf, I would drop in to the Bicycle Works on Argyle Place. At least you can be confident that if they don’t know how to help, they will be honest about it (and their labour charges are very reasonable). Hi there, do you know if it is just the coaster version with these issues? I have the S2 and have done about 1500km on it without any issues (apart from a bit of cracking and pinging now and then) but I get up to 50km/h on my commute and don’t like the sound of the back wheel locking up!! Thanks. Hi Damian – no idea, sorry! Since you’ve already got the hub, I would just keep riding it and see what happens… let us know how you get on! Will do Gotta say though, I love having that extra gear for the flats and downhills after riding SS for the last few years. It came on the Marin Ignacio I bought and I have ridden it on the wet and bumpy roads of Waiheke Island this winter without issue (touching wood now), and that includes a couple of ks of dirt road every day. Cheers. Although I live in the UK in January I bought a SA 8 speed XRF (W) through Bikewagon in the States as their on-line price beat any other retailers here. I had to go for that model as OLN distance on the vintage tandem I was fitting it to was 115 mm. It was fitted as per the guide and tested as suggested in April. We then used the bike 3 times, once for a 14 mile shake down test, then a 30 mile run, adjustments were then made for cable stretching etc before using it for a 180 mile charity cycle. During it we were having trouble finding the gears we were selecting, sometimes it would select, other times it wouldn’t. We found the best way to select them in the end was not just to pause when rotating the cranks but, do a half rotation backwards. This worked until on the 179th mile the hub seized completely. Now we are in the situation of the SA specialist in Edinburgh questioning the warranty as it came from the States. SA need to 1. Get their gears made more reliably and 2. have a better network of distributors for after sales problems. Riding the SC2 since July with joy, maybe half grand miles on it. Winter has set in, now I think the workings are drag. Every crank feels like a push while Sunrace overlooked my question on how to keep it spinning freely lubed. Sludge slowing me to a crawl. December 2014. I had an S2C installed on a Schwinn Corvette a couple years ago, replacing the old Bendix kickback. I’ve put at least 1000 miles on it, mostly flat paved riding in OR and WA, mostly dry. It still works, but it takes multiple kicks to get it to shift. I had a S2C built into a wheel by St John St. about three years ago. It was obviously defective from new, making unhappy noises and not shifting. I sent it back and they fixed it, since when it’s worked perfectly. I think it’s a great minimalist solution to a particular type of riding – pottering about on mildly hilly terrain. The sealing of the hub is a joke, but it’s not a bike I use in wet weather (no mudguards). If the concept appeals, I’d recommend it, but buy from somewhere with support and keep it dry. the s2c hub almost killed me going downhill. i have bruises the bruises to show and the accident almost broke my neck. If sturmey-archer is listening, please recall the product before it kills someone. Have a Torker bike that I bought as new old stock a little over a month ago – unsure how old (1 or 2 years? ), but I believe the hub on this bike should date from after the initial round of problem hubs. The hub worked perfectly for about 200 miles, and it should be said that it is truly great when it does work. However, for the last 50 or so it has refused to shift out of the gear it is in, until you least expect it. Inconvenient and certainly not as designed, but reading more about others’ experiences of this hub, I’m now worried about its potential for catastrophic failure. Going to take it back to the retailer/dealer and see what he can do, or if he knows about the issues with this hub. Will update with fix/further experience of this transmission. This is sad news, as I was about to buy a 2speed hub. Not now. It’s very sad to see SA product turning to such crap. I have original 3 spd hub from 1947, works perfectly ! Sounds like a Swiss watch. I’m glad to come across this post, i was seriously considering buying the beautiful Moulton TSR 2 bike. Unfortunately I need a bike i can ride safely, not just for the looks, so i’ll pass on this one. Brought the hub back to the dealer that summer. They immediately swapped out my rear wheel and took the hub in to take it apart in order to diagnose. They never determined what was wrong with it. In the hundreds of miles I’ve ridden on the replacement hub, I’ve had not a single issue and I no longer fear for my life when zooming down a hill. As time has gone on I’ve grown to trust it more. Suppose the possibility still exists, but c’est la vie. soldiers on through mud and rain. Still difficult to downshift except at a full stop but has always upshifted just fine.